London: cold, unwelcoming, distant. Much the same goes for the average Londoner on the street, too. In a city of such size, maybe it's inevitable that individual humanity goes by the wayside. Distant eyes, distant faces, hunched shoulders. Big clocks ticking on big buildings. Bus drivers openly cursing. People soup. I'm in the capital for a two-hour examination unrelated to my studies, and am looking forward to getting back to the peace of home. 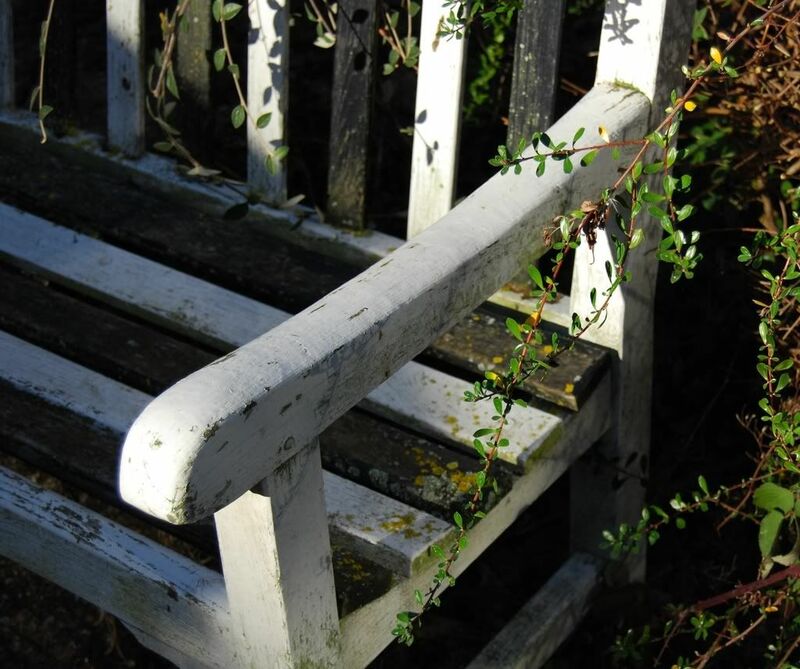 An oasis in the middle of town, TeaSmith is one of the good points of the city, along with all its forgotten churches. I get plenty of both before and after my exam. The cafe doesn't change much, which is a good thing, as they're onto a winner. Warm conversation, good music, decent tea. Of interest on the current menu is a buttery baozhong. They were even kind enough to dig out a 2005 Xiaguan "Wild Big-Tree" cake from a cupboard. Yellow specks (pictured above)! Given the advanced state of decay of most of the cheese that we eat, a little mould won't stop me. Two rinses of boiling water, and we're ready. 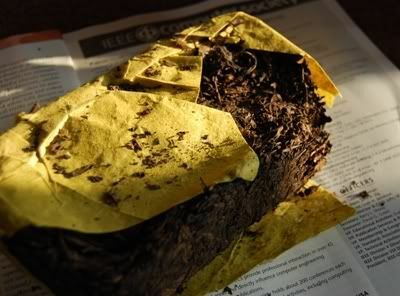 There are plenty of "yellow leaves" evident in this cake, those thin and brittle examples that tend not to impart much flavour, but plenty of bitterness. These are mixed with a good proportion of small, furry tips. 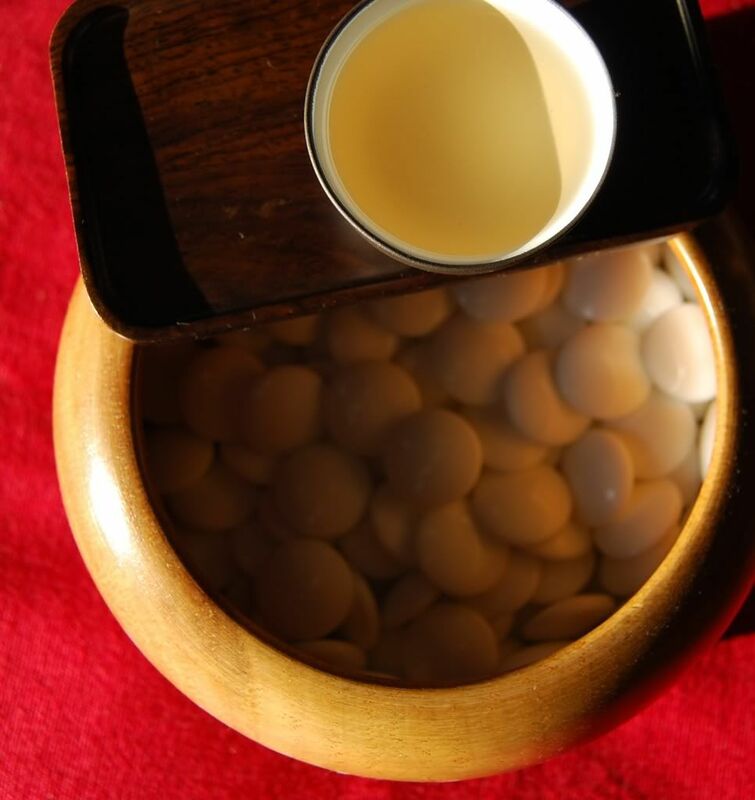 I like shicang tea, so the plentiful shicang [wet storehouse] aroma is fine by me. It also explains the mould..
As you can see, the brew is an encouragingly deep red. 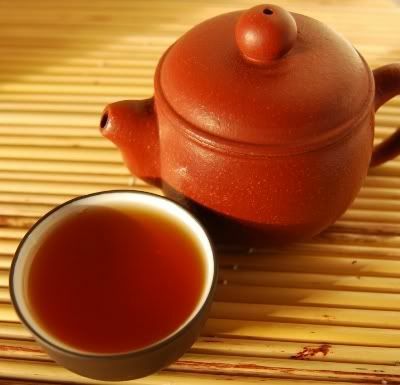 The soup is not too potent; despite filling my small pot, and infusing for long periods, the result is not overbrewed. This could be down to the high concentration of small tip-leaves - always gentle. Maltiness and "dustiness" are present in both aroma and flavour, while the texture is also "dusty", though there is no sediment. 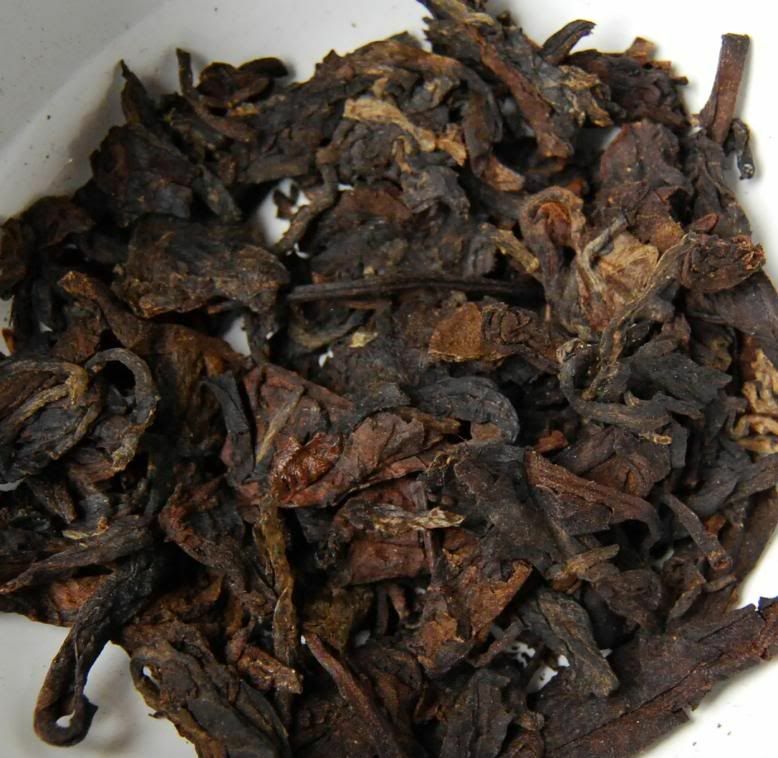 Some ku remains, but it is well on the way to becoming mature pu'er. If you like that familiar and enjoyable "numbness" in the mouth, you'll enjoy this tea. The whole is very gentle. I look for larger leaves in a good cake, in order to provide a solid basis, but this is mostly tips and "yellow leaves". This is easily worth the £40 asking-price. I have been drinking a lot of 2007 Xizihao recently, which is often much more expensive and less interesting. Many thanks, CB, for a great tea. It's a chunky brick, and yet seems remarkably light. Digging into the leaves, it becomes apparent that they are very light - pulling them from the brick causes them to rustle and disintegrate like burned paper. It's a twiggy brew, and no mistake. A gentle "library" aroma hangs about the leaves. It seems worn and gentle, and in that regard not too dissimilar to the 2001 Liuan heicha that we encountered last year. It's a dusty brew from this particularly heicha, and two rinses are in order. The resultant soup is really rather smooth, continuing that pleasantly sweet aroma so loved by bibliophiles the world over. After a session, I am left invigorated and fresh. I know MYSTERIELLA didn't get on with this tea, but I think it's markedly better than the current daily tea that I use in my office. 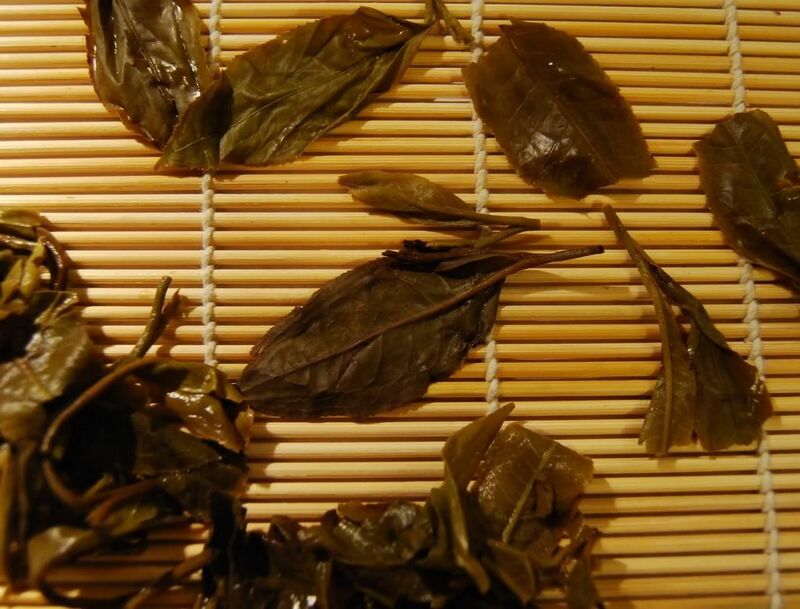 For such use, I look for an undemanding tea that neither requires nor benefits from great attention - this leaf is a decent enough background leaf, and I am very grateful for it. 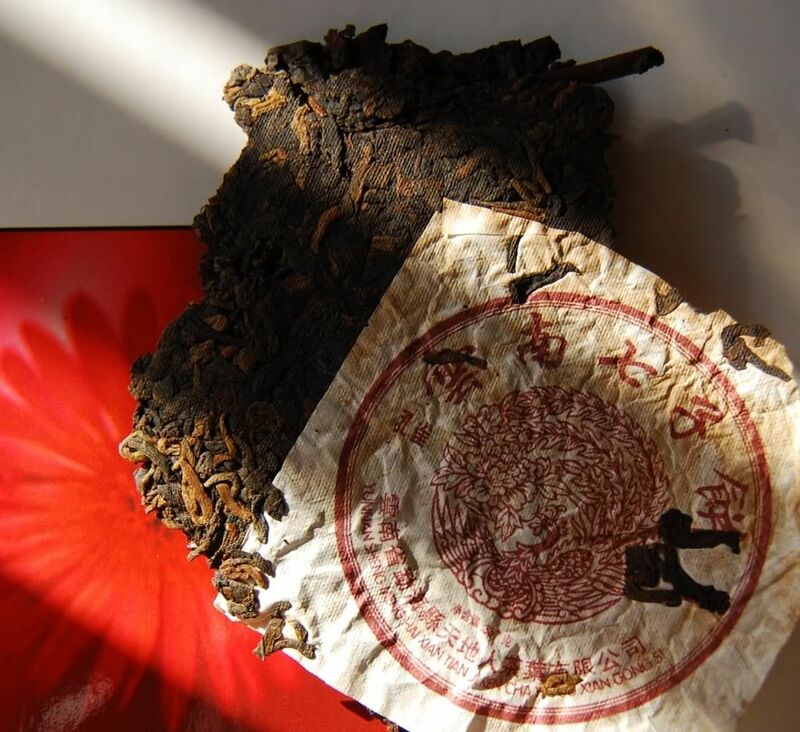 2000 Chen Guanghe Tang "Yiwu Yesheng"
Chen Guanghe Tang: tasty or over-hyped? 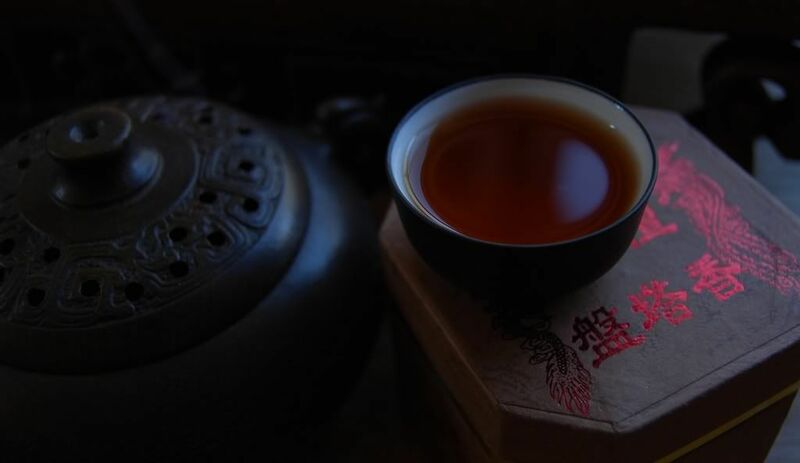 This is the oldest tea I've tried from Mr. Chen's brand, which makes it particularly interesting in comparison to those two chestnuts from 2006, the Yiwu Chawang and the Yiwu Yecha. Unsurprisingly, given that I've not seen Chen Guanghe Tang teas for sale anywhere else, this comes from Houde. Many thanks to the generosity of TA for this sample. It's cold in Blighty at the moment. Cold, cold, cold. Let's fire up the wood stove (ceramic hotplate), throw some logs on the fire (central heating), and get cosy with this fairly costly tea. The day is slow, prompted by the hibernation instinct. 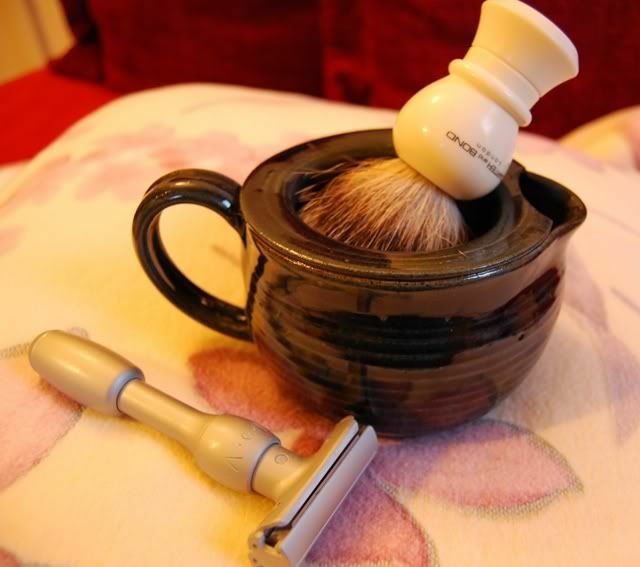 A leisurely shave, breathing the humid air of the bathroom, towel around waist. Lather bowl floating in a sink of hot water. 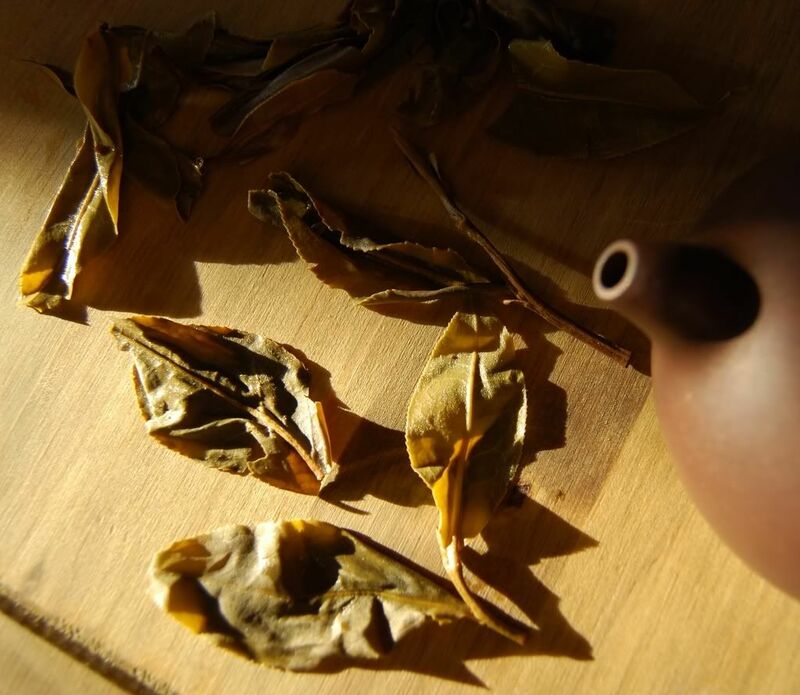 A great introduction to the slow pace of a good tea session. 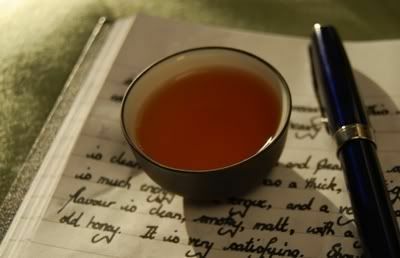 I'm probably biased in favour of the tea already, simply because of my calm and attentive mood. The tobacco shop, breathing in mixed and varied leafy scents, that's where the leaves take me. I spend some time dwelling on this delectable aroma. The rinsed leaves have a slightly suspicious scent of "dark fruits" that I associate with suspicious processing, attempted short-cuts to mature glory. In the wenxiangbei, richness with an appealing smoke to them. With so much love for tobacco and smoke, I daily rue the fact that smoking is bad for one's health, or I would be puffing away with abandon, enjoying these fine scents. As my father drew on his wonderful old briar pipe during his visit this week-end, I confessed that because I cannot enjoy smoking, I enjoy my tobacco-tea as a surrogate. The texture is thick and satisfying, much energy is present on the tongue, and the huigan is solid and pronounced. 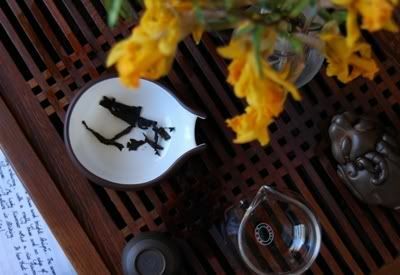 With flavours of clean, slightly smoky, malt and a finish of sweet, smooth old honey, it seems that Mr. Chen has made a good tea. At the equivalent of $100/bing (this being a sample from a 250g brick), it is a touch expensive... but on the scale of Western prices, maybe not too bad. It isn't "99 Green Big Tree", as the product description rather generously awards it, but does give a lot of pleasure. Thanks again, TA. 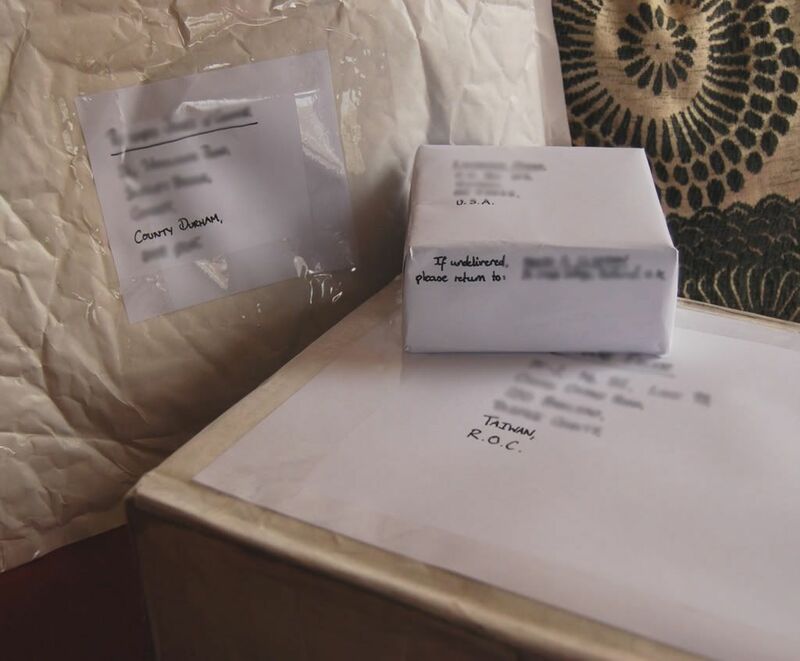 Who sent me this? Own up! I think it was DL or MA... but it might have been DV. Forgive my ailing memory - it's been a while since I last enjoyed it, but I just noticed that there were no Half-Dipper notes for this little number. It's still available from Houde for $18/2oz, and should be fine all the way through 2008 courtesy of its roast. 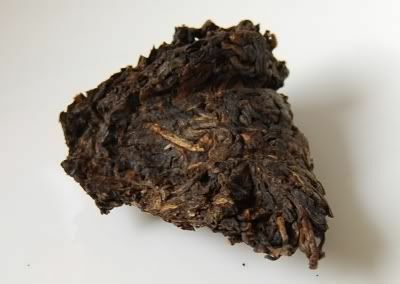 This is a more "traditionally-roasted" wulong, as can be seen from the darkness of the bundles in the photograph above. 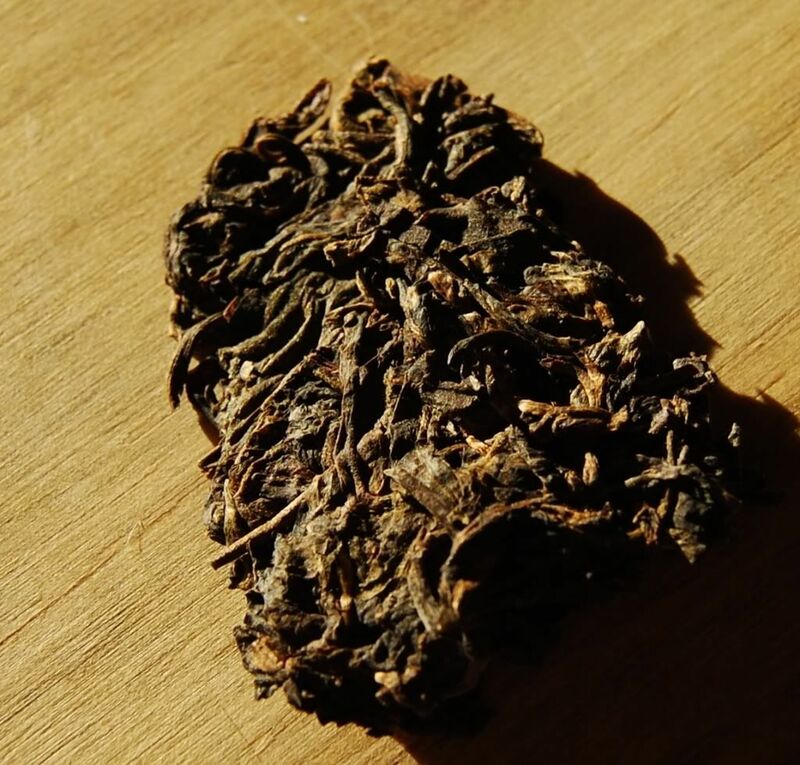 They seem to sit more comfortably on the oft-delicate Asian stomach than some more green varieties of wulong, yet even my coarse old Saxon constitution finds the rounded roast of this tea to be warming and welcome on this bitterly inclement day. 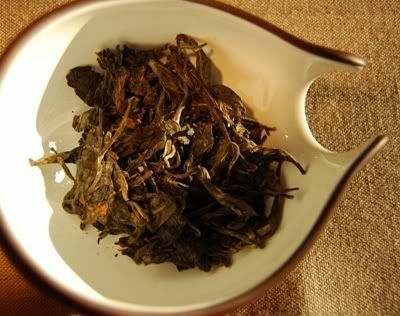 I don't drink enough nongxiang wulong. 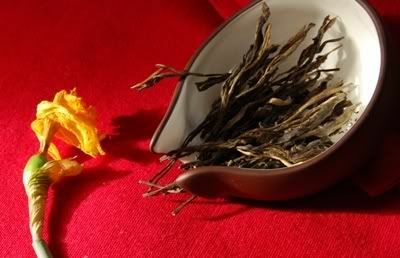 Perhaps, like other heavily-processed teas, this is because it can be hard to find good examples. All too often, cheaper leaves hide behind the heavy processing. Lapsang souchong and shupu fall into this category, too. The soup is a rich orange, and yet has excellent clarity - it is pure glass. 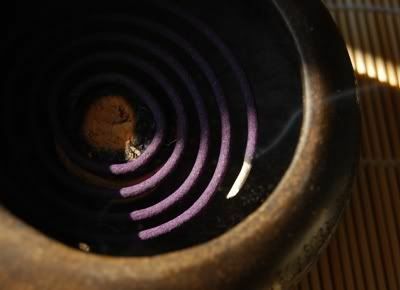 The burned honey aroma is very active in the nose, and lingers for whole minutes. "The scent lingers forever." 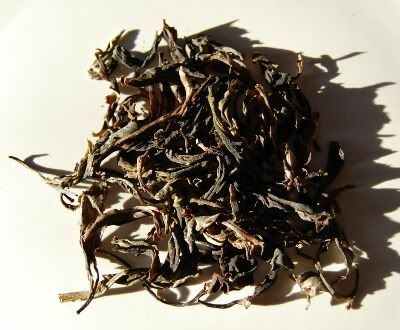 Satisfying flavours: a base of "tea", with a crisp roast that has not been overdone. The huigan is rich in its sweetness, the texture thick. What an enjoyable, hand-picked treat. I find the nature of this tea to be particularly calming, and my heart slows noticeably, as if I had my feet in a bath of warm water. It is a good tea, and I am thankful. 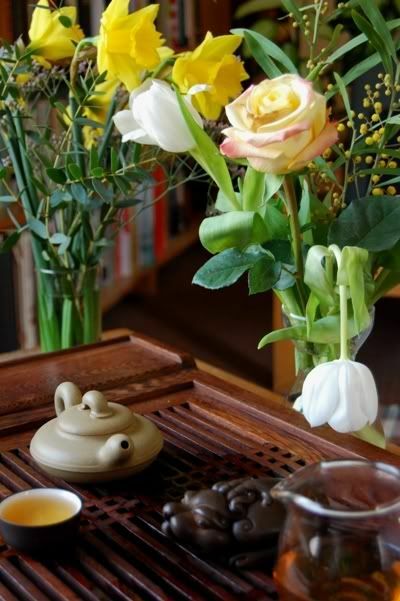 2007 Maison des Trois Thes "Mengkuxue"
Deep in the heart of Paris lies a tea-house with more fabulously expensive tea than anywhere else. Or so the story goes, as I've never made it to Maison des Trois Thes myself. However, Nada has, and very generously left this whopping chunk of shengpu with us after his visit. First experiences are pleasant ones. 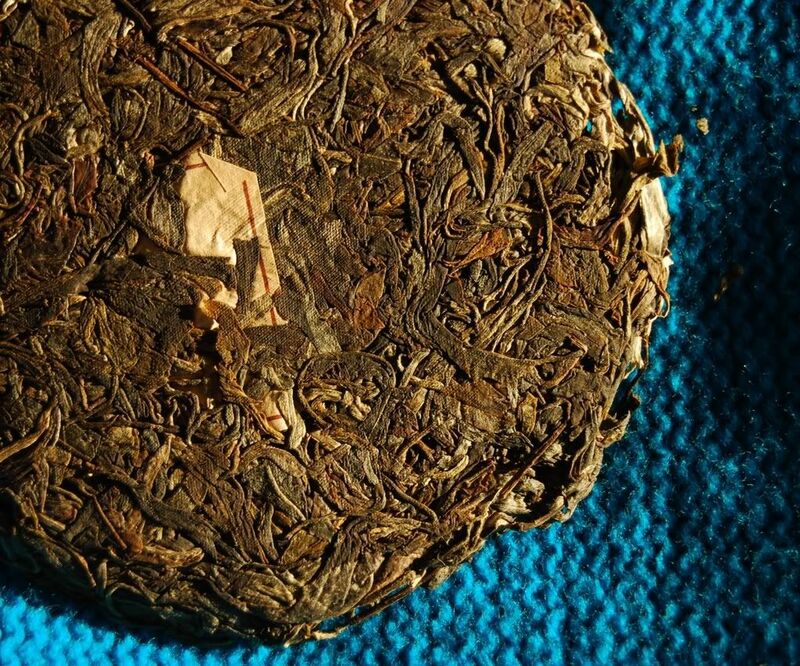 This is a cake chock-full of lovely leaves, and has my favourite shengpu aroma: sweet tobacco. Delicious. I almost took a bite out of it. As ever, you can click on the photos to expand them, and take a good bite yourself. The soup is a solid yellow, and the aroma lingers forever in the wenxiangbei. Flavourwise: it's caramel and rich tobacco, with a pronounced huigan. The texture is gloopy, just the way I like it. I'm coming to understand that tea is a very personal affair, and I strive to find teas like this. So, is this the perfect tea for me? Not quite. 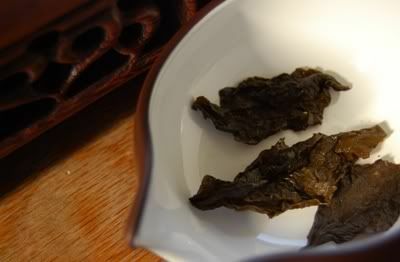 After one or two infusions, it became much more simple, retaining its quality of texture and huigan, but losing much of its complexity in the mouth and nose. 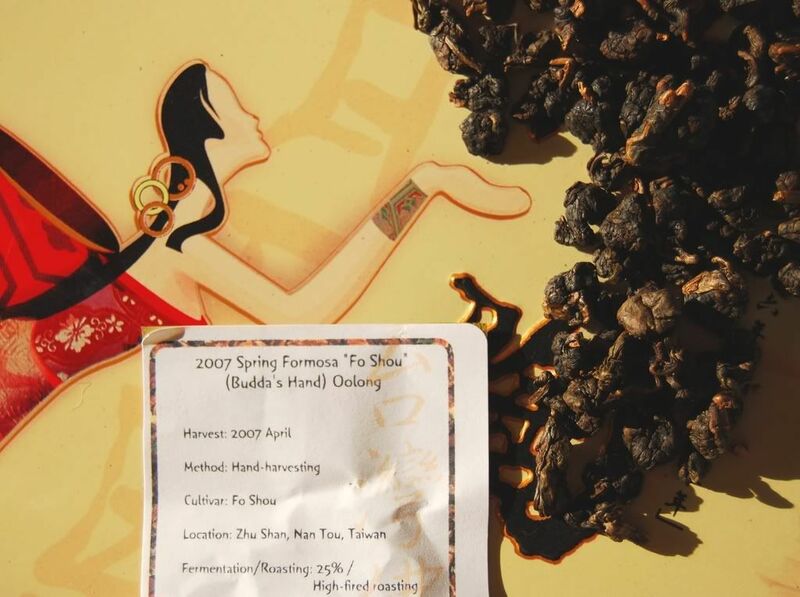 It seems that the leaves are lacking a little "oomph", and it would appear that Madame Tseng has been as hard-pressed to find such examples from the 2007 crop as everyone else. That said, I'd happily buy this cake, if only for those first few infusions in which it really is "my cup of tea". Thanks again, Nada. Always the good evening tea, with its calming sensations and warmth of character, a good shupu is an essential member of our collection. This shupu comes courtesy of GV, who bought it in Hong Kong recently - many thanks! Tiandiren have selected plenty of spring leaves for this cake, which have a fresh aroma of maltiness about them. Does the above photo look a touch dark? It seems different on two different monitors! The aroma from this burgundy-coloured soup is long-enduring, with a pleasant metallic edge that I associate with minerals. Wrap it up in a malty body, and give it a vaguely rice-like finish, and we conclude that Tiandiren can make decent shupu. In its brightest and crisp presentation, it reminds of the heady heights of the Menghai V93, though without the true complexity. The smooth texture of this tea also appealed to me. What a pleasant way to fight off a cold February. Thanks again to GV. We are thankful for multiple blessings this week-end, as "Nada" came to visit us. 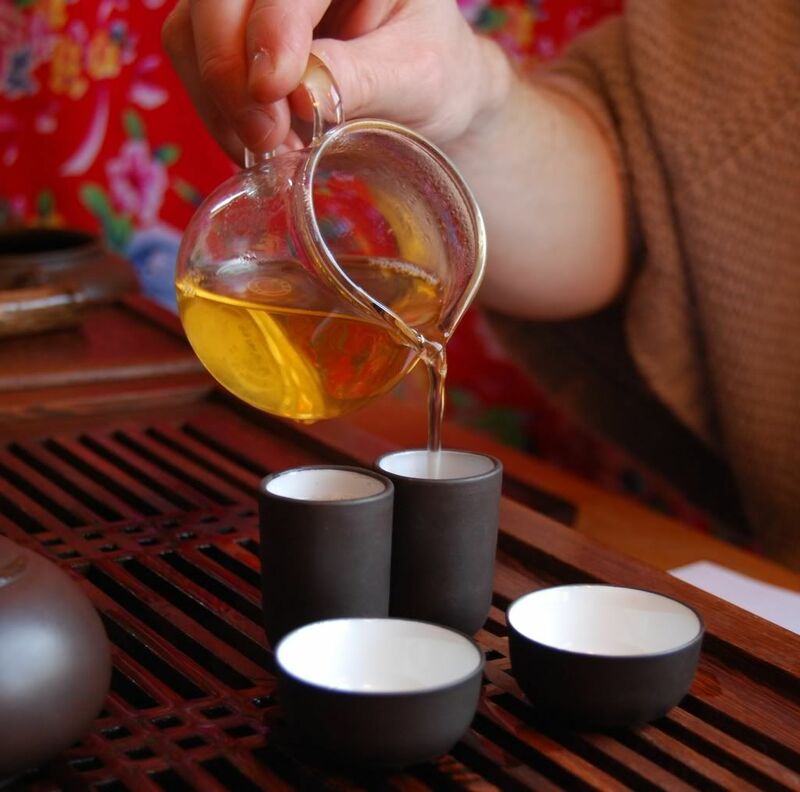 With his smiling eyes and flowing monkly robes, it felt as if Lei and I had known him for a long time, though it was just the first time that we had met outside e-mail and tea-blogs. The flood-water drained away, the sun shined, and all was well with the world. With any luck, Nada is now back in London enjoying some of the fine hospitality at TeaSmith. Of a wonderful day, activities concerning tea-drinking included the rounded delights of the 1993 Red Blossom Maocha (thanks again to the Davelcorp Foundation), and my favourite wulong, the 2004 Dayuling (2650m) from Teamasters. After dinner, Nada revealed his secret weapon, the 1958 Guangyungong - now reaching its half-century. "Twiggy", sayeth he, and indeed it is. 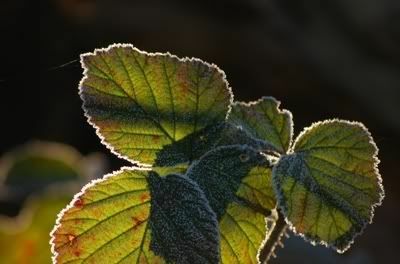 The leaves had a quiet aroma of wet storage, but a crisp one at that. 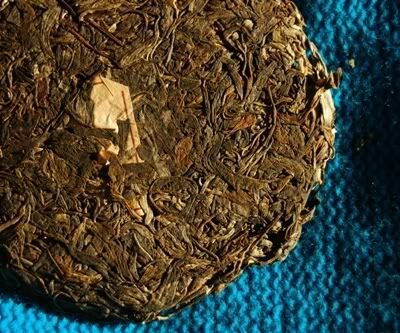 This tea seems not to be too much about its flavour or aroma, being increasingly sweet through its various infusions, with some pleasant sandalwood. 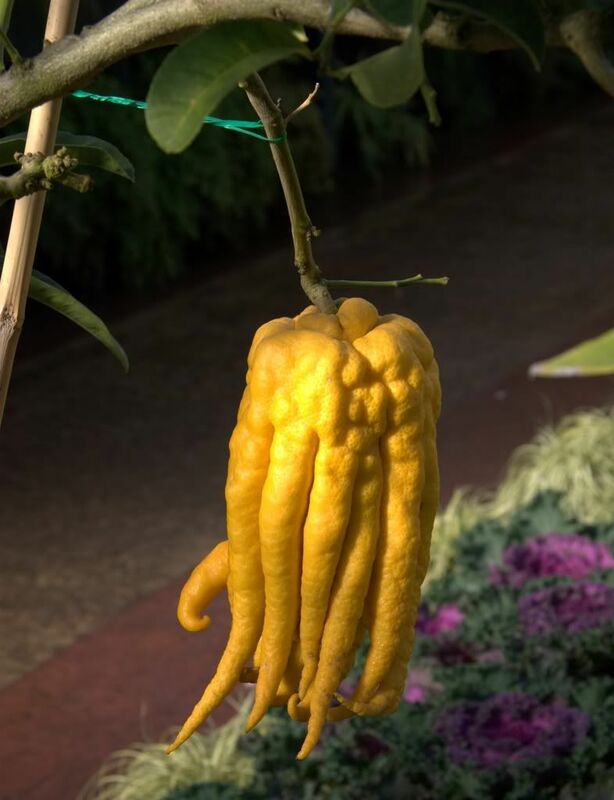 The chaqi was extraordinarily special, however. 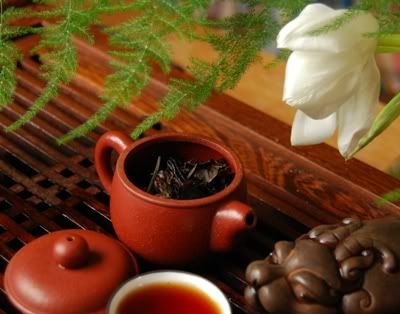 I would love to sit a chaqi unbeliever down with this tea, as even the aroma imparts a dramatic physiological effect. After the first cup, our palms were flushed, our heads giddy, and tingles running up our spines. It was intriguing to hear Nada's descriptions of the effects he noticed within his body, due to his skill in subtle meditation. By the end of the night, we were bright-eyed and alert, and wondering what special magic is accumulated by such a tea over the decades. We wish Nada a safe trip home to Scotland, and hope to see him again soon for, not considering the old tea, it was a wonderful visit from a good friend. New (Chinese) Year, new hangover. 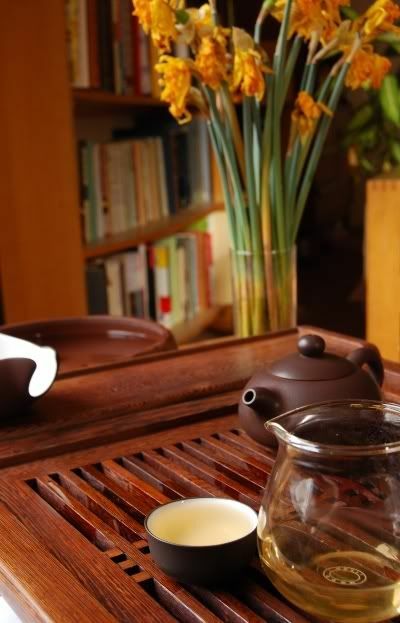 We fire up the kettle and let pu'er work its restorative magic. This is a tea from Houde, with many thanks to TA for kindly providing the sample. Ever the Pinyin pedant, I note that the packet labelled this as "Da Shui Shan" (Big Water Mountain). It has become popular to criticise Xizihao. Though I am keen to treat each sample with an unbiased hand, I can understand why such criticism exists. Xizihao is turning into the Calvin Klein of tea. The public wants a quality brand in which they can trust, and, several years ago, Xizihao was satisfactory. It is my opinion that the popularity of this brand has caused it to bow to market forces, resulting in teas like this Daxueshan [Big Snow Mountain] maocha. 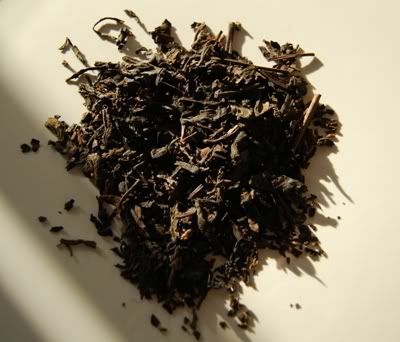 The price increases year by year, the product names become more exaggerated (we recently had a Tea Emperor, rather than a "Tea King", and a Desolate Forest, rather than a "Wild Tree"), product descriptions become more stretched and loaded with hyperbole, and the quality of tea inevitably decreases. 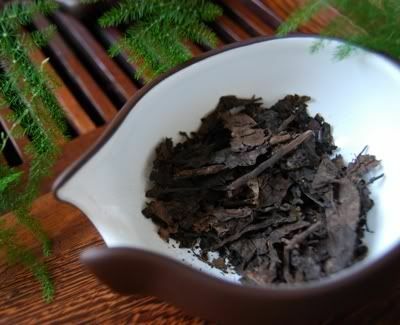 This is a pretty maocha, but dark for less than one year old. In its favour, this is clearly a leaf of good breeding: it has an effervescent energy on the tongue, a mouth-watering huigan, and a decently thick texture. Unfortunately, that's where the fun ends: the flavour and aroma are simple, being light grass and little more. 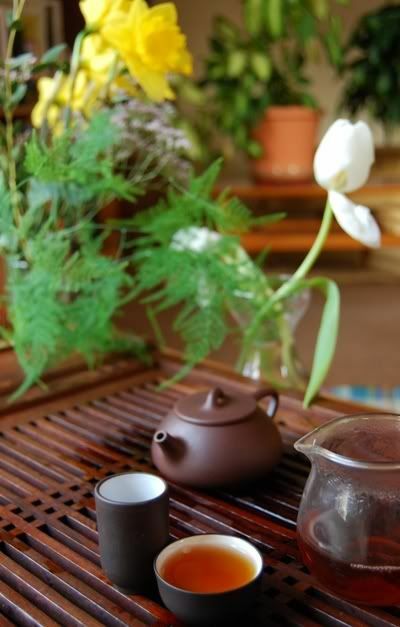 There is absolutely no aroma in the wenxiangbei. I pushed this tea, using longer infusion times and large quantities of leaves, in order to coax some interest out of it. It responded by correspondingly increasing its huigan and astringency, but the character remained ethereally light and vapid. I draw a fourth infusion simply because there is water remaining the kettle. I can agree with very few of the statements presented in the product description for this tea. 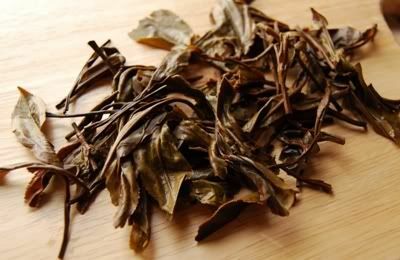 Xizihao/Sanhetang need to make fewer gimmicky teas per year, and return to their roots: proper tea. This tea is the nadir of Xizihao so far, to my palate. I don't drink enough tea like this. Delicious leaves today courtesy of TA - copious thanks, for they are delicious indeed. 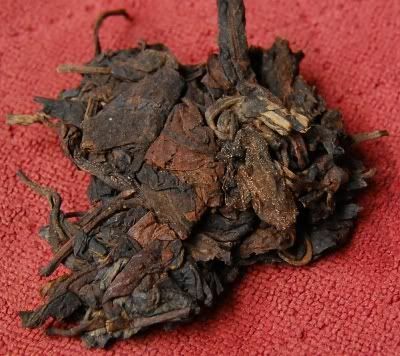 This comely little chunk has been prized from a tuocha of very well-aged shengpu, originally sold by Houde (though it looks as if it has sold out), which TA notes was quite a pricey purchase. Money well-spent, methinks. Nanjian factory have used tasty little spring leaves, with not too many breakages, and compressed them using serious force. Such tight compression usually means that they age slowly, but this one has done very well. It has the best of both worlds: the depth and refined subtlety of maturity, combined with the vigour and energy of youth. If only we could all be so lucky. The chaiqi, huigan, and texture are excellent. The overall feel is liquid library - molten mahogany. A touch of vanilla, some rich maltiness. And before you know it... it's all gone. What a fleeting pleasure. Top stuff. I love maocha. It doesn't get a lot of press, perhaps because it's not the greatest tea to store (although the 1960s Gaoligongshan is a good, old maocha). This tea was bought by TA (many thanks), from his local vendor in the Czech Republic. 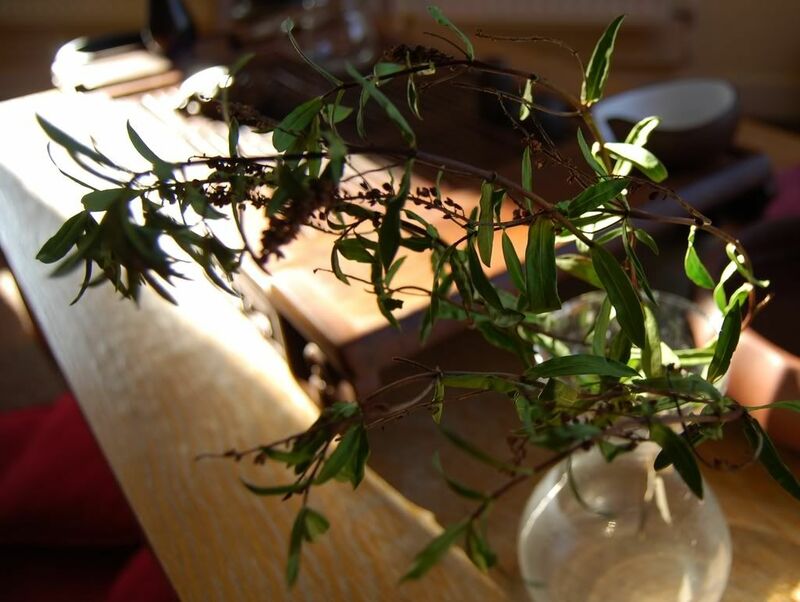 We know little about it, excepting the "yesheng" [wild] in its title, which makes me think of brutally astringent wild-tree leaves. This tea is "yin and yang". Its strong, "yang" element is its sensation: it is wonderfully thick and oily, it has effervescent energy on the tongue, it cools the mouth like mint, and it has a flushing chaqi. It's "yin" element is its flavour and aroma: it is quiet and mushroom-like. The strong sensations mark it out as a good quality tea. The gentle flavours are an unusual mix. This tea responds well to excessive bullying: lots of leaves, very small quantities of water (my 10cl pot has half-filled), and long infusions. Pushing it hard extracts a good huigan and some decent flavour. Anything less than a firm hand and it is a bit too gentle. I'm always in favour of good maocha, and this is good maocha. It didn't strike me as "yesheng" in its flavours, but it was certainly well-grown, as evinced from its sensations.